I don't know if I'm a really GOOD cook, but I do have a reputation for having an adventurous palate and a desire to serve up things at gatherings that are - well, let's just say I usually don't have to worry about anyone else bringing the same thing. I grow a lot of my own herbs, which encourages me to find interesting ways to use them in cooking. I do get asked for recipes sometimes, so I'll share some of my favorites here. Interspersed with the recipes are images that I've scanned from various retro cookbooks and food related product brochures. I like to collect all kinds of examples of paper ephemera from the 1930s to the 1970s. They are fascinating from a historical and graphic design point of view. 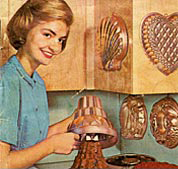 The cooking related pieces, such as recipe books created by food companies, utility companies and appliance companies are some of the most interesting to me for many reasons. You can learn a lot about people who lived at a certain time by seeing what they might have eaten, what marketers thought they might like to eat, and who was expected to prepare it. There aren't very many recipes in these older recipe collections that I would actually want to prepare, unless I alter them somewhat to conform to current ideas about health. Nonetheless I get tremendous enjoyment out of reading them, especially when the writers are really stretching themselves creatively - too far sometimes - to find ways to use their products! 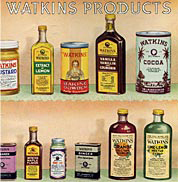 Many items in my collection were passed down to me from my Mom, Grandmothers, and even a Great-Grandmother, so there is family history contained in those food books and pamphlets. If there are handwritten notations in the margins such as "Excellent" or "Don" (my Dad), that means a family member, possibly even with me in attendance, probably ate this very dish. One of the recipe books in particular (the cover is pictured at right) I remember being fascinated with when I was very young - I remember loving the drawings in it, and drawing cartoons inspired by them. I'm sure it helped influence my lifelong love of retro and mid 20th Century design. I frequently make an appetizer recipe that I got from the Dierbergs Everybody Cooks magazine. The recipe uses canned crescent roll dough, pesto, and minced roasted red bell peppers. It is quick to make, easy to serve and eat at a party, and always gets gobbled up. You know a recipe is really good if I make it more than one time, because normally I have no interest in making the same thing more than once, it takes the fun out of it if I know ahead of time exactly how it will turn out! I decided to try a version with something other than pesto, since I didn't have any and didn't feel like going to the store, and it turned out great with frozen spinach. By the way, the Everybody Cooks magazine has fantastic recipes! They seem to always turn out delicious. Thaw and drain spinach, squeezing out the liquid as much as you can. Place spinach in a small mixing bowl, and mix with the basil, caraway seeds, olive oil, and salt. Using one-half of the contents of a can of crescent roll dough at a time, place the dough on a work surface and press the perforated edges that normally divide the dough together. Sprinkle 1/4 of the spinach mixture on top, then roll the dough up into a spiral tube. Spray a cookie sheet with butter-flavored spray. Slice the spinach/dough roll, and put the slices on their side on the sheet. Make another roll with the second dough half, and fill the rest of the cookie sheet with slices. Bake for about 15 minutes at 350 degrees, and remove from oven when the dough is light golden on top and medium golden brown on the bottom. This one came about because I had a lot of sunflower seeds that I had bought to put on top of salads, and after I ran out of salad, I was afraid I was going to eat the rest in one sitting if I didn't figure out something to make them into. 1/2 can green olives, chopped - the olives I used were from a health food store, and were not as salty as I'm accustomed to. If your olives have the usual amount of salt in them, you might want to try making this with one half the amount of olives to start, then taste it to see if you risk making it too salty by adding more olives. Put the cream cheese into a small sturdy bowl to soften. Chop the sunflower seeds in a blender or food processor or nut grinder until the pieces are like a coarse grind of coffee. Add to bowl. Chop the olives and add to bowl. Add seasonings, and mash all together with a fork until thoroughly mixed. Serve with your favorite party crackers. Copyright © 1958 Milliken Publishing Company. Illustrations by Pres Bagent and Paul Stoddard. This appetizer was a hit at the latest Trivia Night (but it didn't help us win). Put cream cheese into a medium sturdy mixing bowl. Chop walnuts, chives, and parsley and add to bowl. Add onion powder and dill. Mix cream cheese, nuts, and seasonings together with fork. Spread a layer of mixture onto a tortilla, then overlay several spinach leaves, and then place a piece of ham on top. Roll the tortilla up, and slice into sections. Repeat until all the mixture is used up. Makes enough appetizers for approximately 8-10 people. Press the garlic cloves through a garlic press and put the pulp in a small microwave safe mixing bowl. Add cream cheese and soften for a few minutes in the microwave. Add other ingredients and mix thoroughly. Taste and see if the seasoning is right, and add more if it isn't enough. Cook mixture in the microwave for about two minutes, stir, and cook for about another two minutes. Serve hot with veggies, crackers, or tortilla chips. I made this as a spread for a chicken sandwich, then tried it as a veggie dip. Both ways were delicious! This recipe is from Zorba Paster on Your Health. Place tofu in a colander to drain. Let sit for 15 minutes. In a large bowl, mix tofu, mustard, and spices with a wooden spoon until tofu is uniformly crumbled and spices are well blended. Stir in vegetables and 2 TBSP honey. Add more honey if needed to make a smooth mixture. Serve as appetizer on crackers or in pita pockets. This recipe came from Dierbergs Everybody Cooks magazine. Serve with Olive Tomato Spread. In mixer bowl, combine flour, sugar, baking powder, and rosemary. Add butter. Beat at medium speed until fine crumbs form. Add olives. Stir in eggs, one at a time, until well mixed. Divide dough in half. On lightly floured work surface, shape dough into two 14-inch logs. Place on parchment-lined baking sheets, pressing to 1/2 inch thickness. Bake in 350 degrees F. oven until golden brown, about 25 to 30 minutes. Remove from oven and reduce oven temperature to 300 degrees F. Place logs on cutting board; cool slightly. Using serrated knife, cut logs diagonally into 1/2 inch thick slices. Place cut-side up on parchment-lined baking sheets. Bake in 300 degrees F. oven until dry, about 15 to 20 minutes; cool. Store in airtight containers at room temperature. This recipe came from Dierbergs Everybody Cooks magazine. Serve with Olive Rosemary Biscotti. In a small bowl, combine all ingredients; stir until blended. Refrigerate for up to 3 days. Makes about 1 1/4 cups. This recipe is from the Webster Groves Herb Society cookbook. *Sour milk by adding a splash or two (tablespoons) of herbal vinegar, or lemon or lime juice to milk; let set 10 minutes. Combine flour, cornmeal, salt, pepper, cayenne, and herbs. Stir in cheese, then butter; mix thoroughly. Drizzle in sour milk, stirring until mixture holds together. Turn dough onto a floured board; roll it into a log about 1 1/2 inches in diameter. Wrap in plastic; chill until firm. (Slice log in sections, so you can pull out one to slice, since it will take at least two cookie sheets.) Slice crackers 1/8 inch thick and place on lightly greased cookie sheet. Bake at 350 degrees F. about 12 minutes or until crackers start to turn light brown; then flip and brown other side for a few minutes. Cool on a rack and store in an airtight container. Dough can be mixed up to three weeks ahead, shaped into rolls and frozen. Let frozen dough thaw slightly before slicing. I made this to go with the cornmeal crackers. Soften cream cheese in a sturdy bowl. When soft, add the rest of the ingredients and mash together with a fork. This recipe is from Wild Oats market, and modified slightly. If you have a food processor, combine yogurt, tahini, oil, garlic, spice and herbs. Blend and then add garbanzos, pureeing until smooth. If you don't, put all ingredients into a sturdy bowl and mash with a potato masher. This recipe is from Hautly Cheese. 3 oz crab meat (if canned, be sure to drain well. Combine all ingredients in a food processor, occasionally scraping the bowl. Do not overprocess. Use pulse button for best results, about 2 minutes. This recipe is from Weight Watchers, modified. It makes four servings and each serving is 3 Weight Watchers points. Makes 6 servings and each serving is 4 Weight Watchers PointsPlus points. Chop Vegetables and put in medium sized bowl. Put garlic clove through a garlic press and add. Add lime juice, Mexican seasoning and Fruit Fresh and mix all together. Makes 4 servings and each serving is 4 Weight Watchers PointsPlus points. Heat oven to 400 degrees F. Spray a cookie sheet with the cooking spray. Slice and seed peppers and place in a bowl. Toss with olive oil and salt and pepper then place on cookie sheet. Roast until peppers are tender, about 18 minutes. While peppers are roasting, slice radishes set aside for serving. In a food processor, puree the beans and garlic until smooth. When peppers are done, add them in with vinegar and blend until combined. Season with additional salt and pepper if needed. Serve with radishes. This dip also tastes great spread on crackers with radishes on top. Makes 8 servings and each serving is 4 Weight Watchers PointsPlus points. Mix dry ingredients in medium mixing bowl. Add broth and lime juice and mix well with hands. Roll dough into 1-2" in balls. Set oven to 400 degrees F. Put parchment paper on baking sheet(s). Cut two additional squares of parchment paper and place one on the base of a tortilla press. Spray cooking spray on paper and place a ball of dough on it. Spray other piece of parchment paper and place on top of dough ball. Press down tortilla press. Remove one layer of parchment paper and move remaining sheet with dough over to cutting board. Cut to shape with pizza cutter. Place chips onto parchment paper sheet, sprinkle with Mexican seasoning and bake for 12-15 min. Repeat as needed. This recipe is from Steven Raichlen's Healthy Latin Cooking, altered. Makes 6 servings and each serving is 7 Weight Watchers PointsPlus points. Cut pork loin into 1/2" cubes. Chop onion, bell pepper, tomato and olives. Put in large saucepan over medium heat and cook for 5 minutes, stirring often, until pork is no longer pink. Put garlic clove through garlic press and mix in. Add cumin, and salt and pepper to taste. Transfer mixture to food processor and grind. Add breadcrumbs and blend well. Put in refrigerator until cool - this will give the juices a chance to be absorbed by the bread crumbs. Preheat oven to 400 degrees F. Coat a baking sheet(s) with cooking spray. Break egg and put in small bowl and beat. Place one wonton wrapper on a small plate and brush two of the four edges with egg. Put a heaping teaspoonful of pork mixture in the middle of the wonton wrapper and fold over. Crimp edges with fork. Repeat until all pork mixture is used. If there is any egg left over, brush over top of empanadas. Spray top of empanadas with cooking spray. Cook 6-8 minutes or until crisp and golden brown, turning once. Makes 24 servings and each serving is 1 Weight Watchers PointsPlus point. Preheat oven to 400 degrees F. Spray mini muffin tin with non-stick spray. Squeeze extra water out of shredded zucchini. In a bowl, combine eggs, onion, cheese, breadcrumbs zucchini and pepper. Fill muffin cups to the top. Bake for 15-18 minutes or until top is browned and set. This recipe is from Weight Watchers, altered. Makes 8 servings and each serving is 1 Weight Watchers PointsPlus point. Can also be used as a sandwich spread. Preheat oven to 375 degrees F. Place whole eggplant on a baking sheet and pierce it in several places with a fork. Roast for one hour, turning once. Let cool. Chop eggplant, cucumber and garlic and place in a food processor. Add oil, lemon juice, salt, pepper and zest. Puree until smooth. Spice up your morning coffee or tea by putting this blend in your brew. Copyright © 1964 General Mills. Illustrated by Roger Bradfield. Tip: When you have a recipe that calls for fresh ginger, buy more than you need. It's hard to buy the exact amount you need anyway since ginger roots come in a variety of irregular sizes. Thinly slice the unused portion and freeze it. When you make tea, drop in a slice or two when it's brewing. Delicious! This recipe makes one serving, and is 5 Weight Watchers points. It's a favorite of myself and my pet starling Attila - he likes to sip it right out of my glass. Variation: To add a little extra fiber to your smoothies, when you first open the can of protein powder, add 1 TBSP of flaxseed meal and 1 TBSP of wheat germ, and shake the can well to mix. This recipe makes two servings, and each is 2 Weight Watchers points. Makes one serving and it is 1 Weight Watchers PointsPlus point. Crush ice and put in a blender. Add other ingredients and blend well. Pour into a tall glass and serve with a spoon. Garnish with a sprig of mint if you want. This recipe is from Whole Living magazine, altered slightly. Makes 2 servings and each serving is 2 Weight Watchers PointsPlus points. Makes 1 serving. Calories 245, Fat 2.8g, Carbs 38.1g, Protein 20.2g. I more or less used the recipe from the Penzys Spices catalog, with the addition of two extra ingredients. Cook and peel shrimp. To make the dressing, mix 1 TBSP Greek Seasoning with water, let stand a minute, then add yogurt, balsamic vinegar, and honey. Put the salad greens in a large bowl, then cut up the tomato, onion, bell pepper, and cucumber, and toss all together. This is a simplified version of a recipe from Gourmet magazine. Probably the best salad I've ever eaten. And very easy. There are so few ingredients that you might as well keep most of them separated until you're ready to eat, for maximum taste and fresh appearance. Put greens into a salad bowl. Slice the endive and add to bowl. Cover salad and keep in refrigerator until ready to eat. Slice the beets into strips and keep in a separate container in the refrigerator until ready to serve. Crumble the feta cheese, and store. When you're ready to serve the salad, put some greens and endive into a bowl or onto a plate, top with beets and feta cheese, and season with red wine vinegar, olive oil, and a touch of salt, if needed. The feta cheese might be salty enough for you already. Whisk ingredients together in a small bowl, pour over salad. Variation - try using Pomegranate sauce instead of the orange juice. A long time ago I was on a hike at Saguaro National Monument in Arizona and I observed an iguana eating prickly pear fruits. The big lizard looked funny with its face all purple from juice. I always meant to try eating the fruit myself but never did exept in cactus candy that I bought, until recently when I saw some prickly pear fruits for sale at Sappington Farmer's Market on old Route 66 in South St. Louis County. There is a radio show I like called Food Talk with the Kelly Twins on 550 KTRS, and during one of their shows they advised buying something you've never cooked with before each time you go shopping, and make something with it. That's a good way to learn to cook, they said. It's probably something I would do anyway since I like to try new things all the time, but it's good advice for everybody. Here is one of my prickly pear fruit experiments. Unusual, but plate-lickin' good! Rinse prickly pear fruits and peel off skin. Chop into chunks and press through fine-holed strainer over a bowl to catch juice. You will not be able to remove all the juice at once since the pulp is very mucilaginous, but press out as much as you can. You will end up with a couple of small handfuls of seeds and pulp. Put seeds and pulp into a small mixing bowl and pour enough salad oil over it to cover. With an electric beater, beat the mixture thouroughly. The idea is to separate as much pulp and juice from the seeds as you can while leaving the seeds intact (who knows I might plant some!). Press this mixture through the strainer into the bowl already containing juice. There will still be some pulp clinging to the seeds. Return pulp and seeds to mixing bowl, cover with white balsamic vinegar, and beat again. Press mixture through strainer again into the bowl already containing juice and pulp/oil mixture. Discard remaining pulp and seeds (or maybe not - see this recipe!). Season remaining juice/pulp/oil/vinegar mixture to taste with the herbs, lemon and lime juice, pepper and salt, and pour on a salad and enjoy. The finished dressing is a bright pinkish purple color, so it would look festive on a colorful salad. For example, mandarin oranges and spinach - mmm! Cook quinoa according to directions, adding the vegetable boullion cube along with the water. While it's cooking, chop the cucumbers into roughly 1" square pieces. After quinoa has cooled, put it in a salad bowl, and add the cucumbers, onion, white wine vinegar, recaito, and lime balm. Mix all together and serve chilled. Combine all ingredients in bowl and mix well. Enjoy. I modified this salad from a recipe originally from Self magazine. Chop the tomatoes into 1 to 1 1/2 inch pieces. Remove husks from the tomatillos, and chop in a similar manner. Put pieces into a large salad bowl, add other ingredients, and toss together. Serve chilled. Cook chicken breasts by placing in a cooking pot, covering with water, adding a pinch of salt, bringing to a boil and then simmering for 15 minutes. This is my favorite method for cooking chicken because it's easy and it yields broth I can save for making soup or cooked grains (couscous, quinoa, barley, rice, etc.) later. To make more interesting chicken and broth, you can also add parsley, pepper, bay leaves, and favorite spices that won't clash too much with whatever you might make later. If you grow herbs as I do, this is a good opportunity to use dried herb stems that are difficult to find a use for. You might throw in odds and ends of veggies as you're chopping them too, to add flavor and nutrients to the broth. When the chicken is done cooking, remove from the water and place on a plate and stick in the freezer to cool off. Strain out broth and reserve for later use. Next, chop the cucumber, bell pepper, papaya, onion, and cilantro and place in a large bowl. Grate the zest from two limes and add to the bowl. Cut the limes in half and juice them, and add juice and pulp to bowl. Grate the ginger and add. Add pine nuts, soy sauce, honey, and chili paste. Mix all ingredients in a blender. Pour over salad and enjoy. Also good without the eggs. Makes 4 servings, each serving is 2 Weight Watchers points. Peel and trim beets. Cut into 1 1/2 inch by 1/2 inch pieces. Place beets into empty salad bowl and toss with olive oil. Spray a cookie sheet with cooking spray and place beets on it. Roast in 450 degrees F oven until tender and lightly browned, about 25-30 minutes. While beets are roasting, toast the walnut halves, let cool, and chop. Add to salad bowl with spinach, mint, lemon balm, feta cheese, and black pepper. Make the dressing by chopping the scallions and adding to a blender along with the balsamic vinegar, lemon juice, stevia, salt, and dry mustard. Blend until smooth. When the beets are done roasting let cool, add to salad and enjoy. This recipe is from Uncle Ben's rice, modified. It makes 5 servings and each serving is 5 Weight Watchers points. Chop plum tomatoes and cilantro. Place in large bowl along with rice, corn, and shrimp. Mix well. In a small bowl, mix lime juice, cayenne pepper, cumin, salt, garlic powder and black pepper. Pour over salad and mix well again. Chop avocado into 1/2 pieces, toss with a sprinkle of Fruit Fresh in the bowl you just used for the lime juice, and add to top of salad. Allow any frozen ingredients to thaw, and serve chilled. This recipe is from Sauce Magazine, modified. It makes six servings and each serving is 1 Weight Watchers point. Put salad greens in a large bowl. Trim roots from cress, wash, chop and add to bowl. Peel and section the grapefruit and orange, chop sections into bite-sized pieces and add to bowl. Chop apple and add to bowl. In a small bowl, mix together olive oil, balsamic vinegar, lime juice and brown mustard, then drizzle over salad. Serve. If you're tired of the same old salad, this taste is a little different. It makes six servings, and each is one Weight Watchers PointsPlus point. Add 1 tsp olive oil and 1 tsp vinegar to each serving to make it two points. Chop apples and put in a small bowl. Sprinkle with Fruit Fresh and toss. Put spinach in bowl. Chop fennel bulb and onion and add to bowl. Be sure to save the fennel stems, they are good roasted. Add apples, top with a sprinkle of celery seed. Here is a good thing to make if you have a mango that is too soft to make into anything else. It makes four servings, and each serving is 2 Weight Watchers PointsPlus points. Put all ingredients in blender and blend until mango is pureed. Pour over salad. Do you want some slaw that is so good you'll want a second and third helping? It makes six servings, and each serving is 4 Weight Watchers PointsPlus points. Put shredded carrot, cabbage, onion and cranberries into a large salad bowl. In a small bowl, mix together yogurt, mustard, salt, white pepper, sugar, stevia, vinegar and lime balm. Pour over salad and toss all. Top each serving with a TBSP of sunflower seeds. If you're tired of the same old salad, this is spicy and different. It makes four servings, and each serving is 4 Weight Watchers PointsPlus points. In a medium sized bowl, mix together yogurt, cayenne pepper, garam masala, lemon juice, ginger and cumin. Add in garbanzo beans, bell pepper, cilantro, mint and mix well. Divide arugula into four bowls. Cut cumcumber into half moon shapes and arrange in circles on top of arugula. Place 1/4 of the garbanzo bean mixture into the middle of each salad and serve. This is a Betty Crocker recipe from the early 1970s that I have modified. It makes six servings and each serving is 2 Weight Watchers PointsPlus points. Copyright © 1956, Cutco Division of The Aluminum Cooking Utensil Co., Inc. Illustrated by Frank Marcello. Cook brown rice in vegetable broth or seafood broth. Cook shrimp if needed. Chop shrimp, celery, water chestnuts, green olives, bell pepper and onion. Combine with rice in large bowl. Add salt, pepper, Old Bay Seasoning, lemon juice and Miracle Whip and mix well. Cut tomatoes into wedges. Serve rice mixture over salad greens and tomato wedges. Makes 10 servings and each serving is 7 Weight Watchers PointsPlus points. On the night before, place split peas in water and let sit in refrigerator overnight. Make vegetable broth. The next day, drain split peas and put them in a cooking pot and cover with 2" of broth above peas. Bring to a boil; cover, reduce heat and simmer 25 to 30 minutes or until tender. Drain well and cool (you can retain any drained off broth to cook couscous). Bring 14 oz of broth to boil in a medium saucepan and gradually stir in couscous. Remove from heat; cover and let stand 5 minutes. Fluff with fork and chill. Get out a large salad bowl. Chop bell pepper, mint leaves, parsley and scallions and add to bowl. When chilled, add split peas and couscous. Put garlic cloves through a garlic press and put in small bowl. Mix in lemon juice, olive oil, brown mustard, pepper and salt. Pour this mixture over salad, add feta cheese and toss all together. To make dressing, zest and juice lemon, and place lemon juice and zest in a small bowl. Add olive oil and season with salt and pepper. Heat oven to 400 degrees F. Spray a cooking sheet with cooking spray and place prosciutto on top, after tearing into 3" pieces. Bake until crisp, about 8 minutes. Chop chives and sun-dried tomatoes. To serve salad, place spinach on plate or in bowl, then top with sardines, chives and sun-dried tomatoes, prosciutto and dressing. Makes 6 servings and each serving is 3 Weight Watchers PointsPlus points. Put all ingredients in blender and puree. This recipe is from Cooking Light magazine, altered slightly. Makes 4 servings and each serving is 1 Weight Watchers PointsPlus point. Thinly slice radishes and place in salad bowl. Chop fennel bulb and celery and add to bowl. Mince olives and sprinkle over top of salad along with some of the feathery fennel tops. Mix lemon juice, olive oil, salt and pepper together and drizzle over salad. This recipe is from Weight Watchers, altered. It makes 4 servings and each serving is 3 Weight Watchers PointsPlus points. Place cabbage and carrots in large bowl. Combine remaining ingredients except sunflower seeds in small bowl and mix together. Pour over salad and toss well. Sprinkle sunflower seeds on top. This recipe is from Whole Living magazine, altered slightly. Makes 4 servings and each serving is 4 Weight Watchers PointsPlus points. Combine olive oil, lemon zest, lemon juice, capers, parsley, tarragon and celery in a medium mixing bowl. Drain sardines, and if you don't like the backbones, debone the sardines. Chop coarsely and add to bowl. Mix all ingredients together and serve over salad greens. My Mom gave me a package of Tofu Mate Texas Taco Seasoning Mix that she had laying around thinking that I could think of something good to make with it. Well she was right, it turned out so good I have to share it. 1 package frozen Tex-Mex style vegetables - I used a mix which has onions, red bell peppers, green bell peppers, black beans, and corn. Other frozen vegetable mixes that have similar ingredients would be fine, make sure it includes black beans and corn. Let the tofu chunks drain in a colander while you chop and prepare the other ingredients. Heat some olive oil in a wok or big saucepan. Crumble the tofu into the oil and saute for a couple of minutes. Add in the chopped onions and and put the garlic clove through a garlic press and add it also. When the mix is cooked enough so that the onions are tender, add the Tofu Mate seasoning according to the directions on the package. Mix until the color is even then remove the mixture from the pan and put it in a serving dish with a lid so it stays warm. Mix all ingredients except olive oil together in a large bowl. Place a piece of plastic food wrap on the bottom surface of a tortilla press. Place a small handful of meat mixture on top of that, another piece of food wrap over that, then press all to make a thin patty. When you start to see it squish out a bit, rotate and press a little more to make the patty even in thickness. Fry the patties with olive oil until cooked through and browned on each side. Serve on your favorite bread or bun with tomato, lettuce, and your favorite condiments. If you end up with more meat mixture than you have need for burger patties at the time, you can roll the extra meat mixture into balls, and bake them in a glass baking dish in the oven for approx. 45 minutes at 350 degrees. Cover with foil for the first 30 minutes, remove foil for the last 15 minutes of baking. Drain on paper towels, then freeze them and you'll have delicious meatballs for the next time you want spaghetti and meatballs for dinner. Yum! This is a slightly altered and simplified version of a recipe from Sauce Magazine. Place the tortilla in the center of an ungreased 9-inch pie pan. Set aside. Cook spinach in the microwave just long enough to wilt, 1 to 2 minutes, and set aside. Heat the oil in a large sauté pan and or wok. Add onion and garlic and and sauté over medium heat for three minutes. Add the zucchini and bell pepper and continue to stir until the mixture becomes tender and the onions start to turn golden, about five minutes. Remove from heat and set aside. Break the eggs into a large bowl and whisk well. Add the Parmesan cheese, parsley, salt and pepper. Mix well. Add the spinach and vegetable mixture and mix again. Pour filling into the center of the pie pan, trying to keep the filling from seeping underneath the tortilla. Bake 30 to 35 minutes, or until center of pie is firm and lightly golden. Remove and allow to cool 10 to 15 minutes before cutting and serving. Copyright © 1972 General Mills, Inc. This is a modification of a recipe from Bubba's Bar 'n' Grill. I didn't specify a quantity for the vegetables, just use what will fit in your baking dish. Preheat oven to 425 degrees Fahrenheit. Toss potatoes and fennel pieces in olive oil and put into the dish, cover dish with foil, and cook for 20 minutes. Leave oven on, and remove baking dish. Move potatoes and fennel to the sides of the dish, and lay the fish fillets in the middle. Toss the remaining vegetables and parsley in a bowl with olive oil, and add to dish on either side of fish. Squeeze the lemon juice onto the fish, sprinkle dill onto the fish, and sprinkle salt and pepper to taste over all. Recover dish with foil, return to oven, and bake for another 25 minutes. Tip - After you're done with the lemon rind, put it in a potpourri crock pot with water and your kitchen will smell great! Works with oranges and limes too. And now for something completely normal! Is there anyone who grew up in the St. Louis area who hasn't eaten this many times? There is even a joke that marriages in St. Louis are not really legal unless Mostaccioli is eaten at the reception. Here is my Mom's recipe. Mom had an Italian step-mom (no I don't have the meatball recipe :( ), so this recipe might be especially authentic, but on the other hand, as I once read somewhere long ago, in St. Louis "Italian Food is just food". Meaning much is consumed by everyone! You can add browned hamburger, chopped green peppers or chopped zucchini to the sauce. Simmer and pour over 1 pkg cooked mostaccioli pasta. I wish I had a dollar for every time we ate this while I was growing up! Simple and good. Mix envelope of Good Season's Italian dressing mix with 2 TBSP oil and 1 TBSP water. Brush on chicken. Bake one hour at 350 degrees F.
Source: The Low Cholesterol Cookbook, Anness Publishing, 1998. Serves 4. Heat the olive oil in a nonstick pan and saute the onion, garlic and celery until softened, not browned. Stir in the chickpeas and tomato sauce, the cover and simmer for about 15 minutes. Cook the pasta in a large pan of boiling, lightly salted water until just tender. Drain the pasta and toss into the sauce, then season to taste with salt and pepper. Sprinkle with chopped fresh parsley, serve hot. Saute onion, pepper and garlic in 1 TBSP butter. Combine onion mixture with chicken, beans and chilies; set aside. Over low heat, combine flour and remaining butter, stir in chicken broth and 1/2 cup cheese. Stirring constantly, continue coooking until sauce begins to thicken and boil. Remove from heat. Dip each tortilla into hot sauce to soften; fill each with 2 heaping tablespoons chicken mixture. Roll up. Arrange rolls in 9 x 13 x 2 inch baking dish. Combine remaining sauce with leftover filling; pour over rolls. Sprinkle with remaining cheese. Bake in 350 degrees F. oven for 30 minutes or until heated through. This recipe is from CompuCook Kitchens. Serves 4. Heat oven to 400 degrees F. In bowl, combine shrimp, tomatoes, garlic, onion, basil and olive oil. Mix well to combine ingredients. Place bread shells on a baking sheet. Divide shrimp mixture into 4 portions and place on top of bread shells. Season with salt and pepper. Top each with 1/4 of the cheese. Bake until shrimp are pink and curled and cheese is melted and bubbly, about 15 minutes. This recipe was taken from Zorba Paster on Your Health and modified. It's just spicy enough to give you a nice warm feeling inside. Be sure to use disposable plastic gloves when chopping the jalapeno - I once had to go to sleep holding an ice pack in each hand to soothe the burning because I didn't do this - I'll never make that mistake again! Drain tofu in a colander. Chop onion, garlic, broccoli, cauliflower, and bell pepper. Put on disposable plastic gloves and remove seeds and ribs from jalapeno, and chop. Place tofu in a large mixing bowl, and crumble with fork. Stir in soy sauce, salt, cumin, turmeric, and black pepper. In a wok, heat olive oil. Add onions, garlic, peppers, and vegetables and saute for 5 minutes on medium heat. Put lid on wok and let stand a minute or two to let the tofu get warm. Remove lid and saute for a minute or two longer. Remove from heat and serve hot. Suggestion - serve with tandoori nan bread. Each mini pizza is 3 Weight Watchers points. Open the can of artichokes and set aside to drain. Preheat oven to 350 degrees. Place the four slices of bread on a cookie sheet and spread 1/4 cup of pizza sauce on each slice. Add the artichokes, dividing between the four pieces. Sprinkle basil and red pepper flakes over all, then add 1 oz of shredded Mozzarella Cheese to each. Bake for about 15 minutes or until cheese is slightly browned on top. Makes four servings, each serving is 6 Weight Watchers points. Cut bell peppers into strips and arrange on the bottom of a glass baking dish. Place fish on top. In a bowl, mix oil, chives, basil, and half the dill. Spread on top of fish. Slice scallion and lemon and place on top of fish. Slice cucumber and arrange on top, and pour chicken broth into dish. Bake covered at 350 degrees F for 20 minutes. While fish is baking, mix yogurt with the other half of the dill and add a pinch of salt. Serve fish and vegetables with dill sauce. Delicious served with couscous to soak up the juices! This recipe makes 8 servings, and each serving is 5 Weight Watchers points. Put tofu in a colander and drain. Cook spaghetti and steam green beans for 8 minutes. If you can do this together in one pot, that works well - I suspended a colander with the green beans in it over the pot where the pasta was cooking with kabob skewers and put the lid over the colander. While pasta and green beans are cooking, start chopping the tofu into 1/2 inch cubes, chop the onion, bell pepper and mushrooms, and mince garlic. Heat olive oil in a wok. Add chili flakes and stir. Add onion and garlic and saute over medium high heat for five minutes, stirring often. Add 1 TBSP soy sauce and stir. Add tofu, bell pepper and mushrooms. Saute about 8 minutes. Add green beans to tofu and vegetable mixture, toss and serve over spaghetti. This recipe makes four sandwiches with dipping sauce on the side, and each serving including sauce is 4 points. You will probabably have some of the sauce left over, and that's good because it makes a delicious veggie dip or creamy salad dressing. Place the salmon fillets in a glass baking dish. In a small bowl, add lemon juice, the garlic cloves run through a garlic press, the olive oil, lemon basil, 1 tsp of the salt, the pepper, and the parsley. Mix well and pour over fish fillets. Put foil over baking dish and marinate in the refrigerator for at least an hour, turning periodically. After you're done marinating, put dish in oven and bake at 375 degrees F for 35 minutes. To make the dipping sauce, put yogurt, cumin, sour cream, mint leaves and 1 tsp of the salt into a blender and blend well. Chill until ready to serve sandwich. Cut cucumber into thin slices and bell pepper into strips. After the salmon is finished baking, you can serve the sandwiches with the fillet either hot or cold. Place fillet between sandwich thins with cucumber and bell pepper. Put 1/4 cup of dipping sauce for each sandwich in a small bowl to serve. This recipe is from Weight Watchers, modified. Makes 5 servings and each serving is 6 Weight Watchers Points. Cook pasta according to directions, adding a pinch of salt to the water. While pasta is cooking, wash and chop the kale into bite-sized pieces and dry in a salad spinner (the crinkly leaves hold a lot of water). Put a large soup pot onto medium heat. Add 1 tsp olive oil and swirl to coat pot. Add turkey sausage and cook, breaking up as you go, until browned. Add the broth, another pinch of salt, pepper, and the kale, and put a lid on the pot and let it steam. Every five minutes or so, check and stir the kale and other ingredients until the kale is limp and tender, replacing the lid in between. To serve, mix in the cooked and drained pasta and sprinkle cheese on top. This recipe is originally from Stonyfield Farm and I've altered it considerably. They say that once you try this chili, you won't want to make any others. That is pretty close to the truth. We made this once for New Year's Day, and we've been making it for the New Year meal ever since. We've also tried it with bison meat instead of turkey and that is also excellent. It makes 10 servings and each serving is 10 Weight Watchers PointsPlus. This one is pretty easy! Each burger is 7 Weight Watchers PointsPlus. Lightly toast sandwich bread. Put Boca burger on small plate and top with sauce, cheese, and basil. Heat in microwave until cheese is melted, 2-3 minutes. Put burger on bread. Makes 12 servings, and each serving is 6 Weight Watchers PointsPlus. Soak pinto beans overnight and drain off water. In the morning, place beans into a large crock pot. Remove turkey sausage from casing, break apart into small pieces, and add to pot. Chop vegetables and add to pot along with all other ingredients. Cover crock pot, turn on medium heat, and let cook all day, stirring occasionally. By dinner time you'll have delicious chili! This recipe is from Weight Watchers, altered. By poaching the chicken breasts, you can reduce fat and at the same time make broth for other recipes. Or cook the penne in the liquid to make it extra flavorful. Makes 6 servings, and each serving is 10 Weight Watchers PointsPlus. Put chicken breasts in a cooking pot and cover with water. Bring to boil and simmer until cooked through, about 10-15 minutes. While chicken is cooking, grate carrot and chop onion. Put chicken on a towel to drain, and reserve liquid for making broth later, or cook the penne in the liquid. Heat the olive oil in a large skillet or pot over medium-high heat. Add carrot and onion and and cook until soft. Stir in garlic, artichoke hearts and roasted peppers. Cook while stirring for about one minute. Add wine and cook for another minute. Stir in the broth and bring to a simmer. Add pasta and cook until heated through, meanwhile chop the chicken then add to skillet along with salt and pepper. Cook until chicken is heated through, then toss in parsley and parmesan cheese, then serve. Makes four servings and each serving is 7 Weight Watchers PointsPlus points. This recipe is from Self magazine, altered. Preheat oven to 350 degrees Fahrenheit. Chop onion. Put lamb and onion into a large skillet and cook on medium until meat is browned, about five minutes. Break up clumps of meat as you go. Transfer meat and onion to a plate with a paper towel on it and let drain. Chop cherry tomatoes in half and place in skillet. Return drained meat and onion to skillet and cook on med-high heat until tomatoes are somewhat soft, about 2 minutes. Remove from heat. Stir in parsley, cinnamon, salt and pepper. Spray a baking sheet with non-stick cooking spray and place on it two pieces of Flatout bread. Spread meat mixture over the top of the bread pieces. Sprinkle 1/4 cup of feta and 1 TBSP of pine nuts on top of each pizza. Bake for 10 minutes. Each serving is 1/2 of a pizza. This recipe is from Weight Watchers, altered. It makes six servings and each serving is 4 PointsPlus points. Put the shrimp, scallops, lime juice and salt in a glass bowl. Stir, cover, and chill for 30 minutes. Warm up a wok and put the olive oil in it. Saute onion on medium-high heat for five minutes. Put the garlic cloves through a garlic press and add to wok. Add oregano, diced tomatoes, olives, and jalapenos. Add in shrimp and scallop mixture. Simmer all until seafood is opaque, about seven minutes. Great served over brown rice! My Grandma Hasenfratz had a cool Betty Crocker recipe collection from the early 1970s housed in a lime green and avocado green box. It was handed down to me which as you can probably guess pleases me greatly. As an added bonus there are some recipes she clipped and attached to blank cards included. I have continued to do that with recipes that I've found. Most of the original recipes are not even close to something you can eat when you're trying to lose weight but just for fun I'm going through it to see how many can be modified into something acceptable. Here is one example that turned out fantastic! It makes 8 servings and each serving is 8 PointsPlus points. If you are used to spicy food you might want to turn the heat up a bit by adding more jalapeno or some cayenne pepper. Poach chicken breasts in water for 20 minutes. While they are cooking, chop veggies. After chicken has cooked, leave water in pan and remove chicken breasts and place them on a plate in the freezer to cool. Cook pasta in the liquid left from cooking the chicken. In a large skillet, saute onion and bell pepper in olive oil until tender. Stir in soup, pimiento and jalapeno. Drain pasta when cooked. Turn on oven and set at 350 degrees F. Spray a casserole dish with four sprays of cooking spray. Chicken should be cool enough to handle now - remove chicken from freezer and trim off any remaining fat and chop. In casserole layer half the noodles with half the chicken, season with salt and pepper. Top with half the soup mixture and half the cheese. Repeat layers. Bake uncovered for about 45 min. This recipe is from Smucker's, altered. It makes six servings and each serving is 6 Weight Watchers PointsPlus points. Chop onion, bell pepper and chicken. Heat oil in a large skillet. Coat chicken strips with fajita seasoning and cook for 2 minutes on medium/high heat or until opaque on both sides. Add bell pepper and onion. Cook until chicken is done and peppers are fork tender. Stir in preserves. Cook 1 minute or until heated through. Fill tortillas with chicken and peppers. Top with cilantro and spinach leaves. This one started out as a Betty Crocker recipe from the early 1970's but I've altered it beyond recognition. It makes six servings and each is 7 Weight Watchers PointsPlus points. Heat oven to 375 degrees F. Chop onion, mushrooms and sausage and add to ungreased casserole dish. Rinse and drain canned beans, add to dish and stir all. Pour spaghetti sauce over all and top with cheese. Bake uncovered for 30 minutes. Makes 8 servings and each serving is 5 Weight Watchers PointsPlus points. Preheat oven to 350 degrees F. Chop onion and bell pepper. In a large bowl, combine all ingredients and mix well. In a large shallow baking dish, shape into a loaf. Bake 1 hour. This recipe is from Whole Living magazine, altered slightly. Makes one serving which is 8 Weight Watchers PointsPlus points. Toast sandwich roll. Spread ricotta cheese on bread and place both halves cheese side up on plate. Press basil leaves into cheese, lay red onion on top and drizzle olive oil over all. Sprinkle with Himalayan pink salt. Place peach and tomato slices between bread. Makes 5 servings and each serving is 3 Weight Watchers PointsPlus points. Served on a hamburger bun it's 7 points. Heat olive oil in large saucepan and saute onion, green pepper and celery until lightly browned. Chop tomatoes and add. Add mushrooms, soy crumbles, tomato juice, paprika, pepper and salt. Lower heat and simmer for 15 minutes. This recipe is from an old Weight Watchers cookbook from 1981 and of course I altered it considerably. It makes 8 servings and each serving is 6 Weight Watchers PointsPlus points. Cook broccoli in microwave. After it's cool enough to handle, blend to a paste in a food processor. Put garlic through garlic press and add. Add other ingredients and mix well. Spray cooking sheet with cooking spray and place meatballs on it. Bake at 350 degrees F for 40 minutes or until golden brown. Makes 4 servings and each serving is 5 Weight Watchers PointsPlus points. Put a medium-sized cooking pot on medium heat. Add olive oil and satue onion until slightly browned. Add other ingredients, putting garlic through garlic press and simmer for 15 minutes. This recipe is from an old Weight Watchers cookbook from 1981 and is somewhat altered. Makes 6 servings and each serving is 8 Weight Watchers PointsPlus points. Cook potatoes and chop into bite size chunks. In a large skillet, place cabbage, onion, salt and broth. Simmer until cabbage and onions are tender. In a small bowl, combine paprika, yogurt, celery seed, nutmeg, black pepper and yogurt. Add with ham into skillet and heat through. Makes 8 servings and each serving is 11 Weight Watchers PointsPlus points. Slice up ingredients and put in a large crock pot, layered. Add olive oil, vinegar and seasonings on top. Cook on low heat for six hours or until potatoes and carrots are tender. This recipe is from the back of a box of Roland soba noodles, altered. Makes 10 servings and each serving is 7 Weight Watchers PointsPlus points. Cook soba noodles according to directions and set aside. Sprinkle with a few drops of oil to keep the noodles from sticking together. Make a sauce with soy sauce, sake and stevia and set aside. Heat oil in large wok on medium heat and stir fry pork with a pinch of salt and pepper. Remove meat from wok and add garlic, ginger, onion, carrots and mushrooms and stir-fry for four minutes. Add cabbage and stir-fry briefly. Add soba noodles and pour in 1/2 of the sauce and stir-fry to mix for a few minutes. Add meat back in and add additional sauce. To serve, garnish with sushi ginger and strips of nori (you can cut up a sheet with scissors). This recipe is from Stonyfield, altered. It makes 12 servings and each sering is 7 Weight Watchers PointsPlus points. Heat oven to 375 degrees F. Coat a 13 x 9 inch baking pan with nonstick cooking spray. In a bowl stir together yogurt, ricotta, 1/2 cup parmesan and broth. Pulse mushrooms in a food processor until finely chopped. In a large skillet, saute mushrooms in olive oil until tender. Chop spinach and bell pepper and add to large bowl. Add mushrooms, salt, pepper and 2 cups of yogurt mixture and mix well. Arrange 4 lasagna sheets in bottom of baking pan. Spread half of mushroom mixture on top, sprinkle with 1/2 cup cheese and drizzle 1/2 cup yogurt mixture on top. Repeat this layer one more time, ending with lasagna sheets. Spread remaining yogurt mixture evenly over sheets. Cover with aluminum foil and back for 45 minutes. Remove foil and sprinkile with remaining 1/2 cup cheese. Bake an additional 15 minutes or until lightly browned. Let sit 10 minutes before serving. Makes 4 servings and each serving is 6 Weight Watchers PointsPlus points. Warm the oil in a large pot over medium heat. Stir in the flour and cook, stirring constantly, until the roux is dark brown. Be careful not to let it burn! Add the onion, celery and garlic and cook until softened, 5 to 7 minutes. Stir in the chicken broth and bring to a boil. Add chicken, seafood, sausage, bell pepper, and black pepper. Reduce heat to low and simmer uncovered for 1 hour, stirring occasionally. Add salt to taste if needed. This recipe is from Whole Living magazine, altered slightly. It makes 4 servings and each serving is 7 Weight Watchers PointsPlus points. Combine vinegar, agave nectar and 1 TBSP of the olive oil in a small bowl. Put garlic cloves through a garlic press and add to bowl. Arrange mushroom caps in a large baking dish and pour contents of bowl over mushrooms. Allow to marinate for at least 30 minutes, longer is good as well. About 35 minutes before you want to eat, place dish of mushrooms into oven uncovered and set oven to 400 degrees F. Set a timer for 15 minutes. After the 15 minutes is up, turn mushrooms over, return to oven and reset timer for another 20 minutes. Heat remainder of olive oil in a large wok and add onion, thinly sliced. After five minutes, add thinly sliced kale and cook on medium-low heat until kale is bright green and soft. By this time the mushrooms should be about done. Top mushrooms with kale mixture to serve. Makes 4 serving and each serving is 6 Weight Watchers PointsPlus points. You will probably have some Kim Chee slaw left over - try it with cubes of tofu. Chop kim chee and water chestnuts. Combine in a medium bowl with sesame oil, soy sauce, sesame seeds, onion, vinegar and broccoli slaw. Fry fish fillets in olive oil over medium heat with grilling seasoning sprinkled on top until fish is cooked through. To serve, warm tortillas, pull apart fish, place fish in tortillas, top with slaw and wrap. This is a good recipe for using up broccoli stems. Makes 6 servings and each serving is 6 Weight Watchers PointsPlus points. Cook broccoli in microwave. When it's cool enough to handle, place in food processor with onion and garlic. Blend well. Put mixture in medium mixing bowl with remaining ingredients and mix well with hands. Spray loaf pan with cooking spray and put in meat mixture. Bake for 1 hour at 350 degrees F.
Wash potatoes, chop into approximately 1 1/2" chunks, and place the pieces into a glass baking dish. Drizzle some olive oil over the pieces, and sprinkle with Greek Seasoning. Toss to cover all the pieces. Cover dish loosely with foil, and bake in the oven for 45 minutes at 350 degrees. This is what I brought to Thanksgiving dinner last year. The recipe came from Martha Stewart Living magazine, and I changed it only slightly, I used frozen orange juice instead of fresh, normal salt instead of coarse, pre-ground pepper instead of fresh ground, and regular olive oil instead of extra virgin because I've heard that the flavor in extra-virgin olive oil is wasted if you cook it, so I use regular for recipes that involve cooking the oil, and extra-virgin when it's not cooked. This is another recipe I liked enough to make more than once. Cut each fennel bulb into four slices. In a large skillet over medium heat, heat butter and oil until sizzling. Lay fennel slices in skillet; cook, turning once, until browned, about five minutes per side. Pour orange juice over fennel; season with salt and pepper. Bring mixture to a boil, then reduce to a simmer. Cook until fennel is tender, about 15 minutes. Add wine, and continue cooking until fennel is very tender and sauce has thickened, about 10 minutes more. Season with salt and pepper and serve warm. Copyright © 1969 PERRYGRAPH Div. Nashua Corp.
Slice each eggplant lengthwise into 4-6 long pieces. Spray a glass cooking dish with olive oil cooking spray, and lay in the eggplant pieces. Sprinkle with a little salt. Cover dish with foil, and bake in the oven for about 25 minutes at 350 degrees, until the eggplant is tender and a little browned around the edges. While the eggplant is cooking, make the peanut sauce by combining the coconut milk, chili paste, peanut butter, brown sugar, lime juice, lime balm, fish sauce, and 1/2 tsp salt. Heat on the stovetop at a low setting, stirring until it's hot and well blended. To serve, place eggplant on a plate and spoon some peanut sauce on top. The peanut sauce also makes a very good dipping sauce for chicken. Spray a large glass baking dish with cooking spray. Cut the carrots and turnips into 1 - 2 inch pieces and put into baking dish. Trim the stems from the fennel bulbs and cut the bulbs into 1 - 2 inch pieces also and add to dish. Reserve the feathery fennel tops. Cover dish with foil and bake in 350 degree oven for 20 minutes. Chop the squash and onion into similarly sized pieces. Mash the garlic cloves into a bowl with a garlic press and add the oil and Greek Seasoning. Stir well. After the first batch of vegetables have cooked for 20 minutes, remove baking dish from oven and add the squash and onions. Pour oil mixture over all and stir to coat all the vegetables with oil. Return dish to the oven for another 15 minutes. This recipe is from the Dierbergs Everybody Cooks magazine. Cut zucchini in half crosswise; cut each half into 6 spears. In large nonstick skillet over over medium heat, spread walnuts into single layer. Cook, stirring constantly, for about 3 to 4 minutes, or until nuts are fragrant and start to brown. Immediately remove from pan; set aside. In same skillet over medium-high heat, melt butter. Add zucchini and cook, stirring constantly, until crisp-tender, about 4 to 5 minutes. Stir in tomatoes and toasted walnuts; cook just until heated through. Top with parmesan cheese. Makes 8 servings. Cook carrots according to package directions; drain and mash well. Combine carrots with lemon juice, 3 TBSP butter and remaining ingredients. Pour mixture into well-greased casserole. Dot top with remaining butter. Bake, uncovered, at 350 degrees F for 15 minutes or until top is brown. Serves 8. This recipe is from Weight Watchers and makes four servings with each serving being 1 point. Preheat oven to 425 degrees F. Thinly slice the carrots and fennel, go ahead and include the fennel stems, they're edible and filling. Coat a large roasting pan with cooking spray. Roast, stirring once or twice, until vegetables start to turn lightly golden, about 15-20 minutes. Season with salt and pepper, sprinkle with zest. *Feel free to substitute grapefruit zest, 1 to 2 tsp of fresh lemon juice, 1/4 cup minced fresh parsley, 1 TBSP minced fresh dill, or 1 TBSP of minced fresh tarragon for the orange zest. This recipe is from Weight Watchers, altered. Do you ever buy a bunch of cilantro and don't use it all and have to freeze the remainder? Not many recipes call for frozen cilantro, but it's good in this dish. Makes 6 servings, each is 2 Weight Watchers points. Preheat oven to 400 degrees F. Coat a glass baking dish with cooking spray. Wash and cut squash into 1" chunks. It is not necessary to peel it unless you find the skin objectionable (it gets pretty soft when cooked). Place squash and onion in baking dish and drizzle olive oil over all. Toss to coat, then add garam masala, salt and pepper. Cover dish with foil, place in oven and bake for 25 minutes. Remove from oven and add chopped cilantro, replace cover and bake for another 10-20 minutes or until squash is soft. Enjoy! I never thought cucumbers could taste so good! Makes 3 servings and each serving is 3 Weight Watchers PointsPlus points. Slice cucumbers. Heat olive oil in a pan and saute cucumbers until they are translucent. Put a clove of garlic through a garlic press and add it to pan. Add soy sauce, toss and heat through. For each serving, drizzle 1 tsp sesame oil on top and sprinkle on 1 tsp of sesame seeds. This recipe is from Weight Watchers, altered. Makes 4 servings and each serving is 4 Weight Watchers PointsPlus points. Preheat oven to 400 degrees F. Coat a large baking sheet with cooking spray. In a large bowl, mix together sour cream, salt, pepper and lime juice. Slice potatoes into bite-sized pieces. Add potatoes and toss to coat. Transfer potatoes to greased baking sheet and roast for 40-45 minutes or until potatoes are golden brown, turning once or twice. This recipe is from Weight Watchers, altered. Makes four servings and each serving is 2 Weight Watchers PointsPlus points. Preheat oven to 350 degrees F. Halve squash lengthwise and scoop out seeds. Place squash, cut sides down in a large baking dish and prick skin all over with a fork. Bake until tender, 30-40 minutes. To make the vegetable topping, chop the onion and bell peppers. Heat oil in a medium skillet over medium-high heatband saute until tender, about 5 minutes. Put garlic through garlic press and add along with tomatoes. Bring to a boil then simmer until vegetables are desired consistency. To serve, remove squash flesh with a fork and separate the strands. Spoon vegetables over squash and sprinkle with 1 TBSP cheese per serving. I didn't measure anything when I made this because I wasn't planning to record the recipe - I had no idea it would turn out so delicious! A couple of hours before you want to eat, break kombu sheets into approx. 4 inch pieces and place in small saucepan. Cover with broth - I used homemade vegetable and chicken broth. Bring to a boil and remove from heat. Place in refrigerator and let seaweed soak in liquid until you're ready to prepare the rest of the ingredients. Chop onion and mushrooms and keep onion separate for now. Heat up a wok to medium high heat and swirl some olive oil or other cooking oil of choice around the bottom and add onions. Saute onions while stirring. After onions are carmelized, add mushrooms and snow peas. Remove kombu from saucepan and add liquid from saucepan to wok and simmer the vegetables in it on medium heat for about five minutes. While the vegetables are simmering, cut the kombu into thin strips. I might try a pizza cutter for this step next time to see if that is easier than using a knife. Add the kombu to the vegetables and heat through. Season each serving with soy sauce, a little drizzle of sesame oil, a sprinkle of sesame seeds and several slices of pickled red ginger. Sprinkle a little of the pickling liquid from the ginger on the vegetables. To make this into a full meal, you could serve with noodles and add some tofu, chicken or shrimp. Copyright © 1962 Grocery Store Products CO. I'm not sure where this recipe originally came from, but my Mom has been making it for years. This year it's my turn to make it so my Mom sent me the recipe. I'll try not to mess with it too much, since it's always one of the highlights of the meal. Preheat oven to 375 degrees F. Coat 16 muffin cups with cooking spray. In a large bowl, combine butter, egg substitute, and broth. Add remaining ingredients and toss to combine. Set aside 15 min. Pinch bread; if dry, add 1/4 cup warm water. Toss. Mixture should be soft and spongy, but not mushy. With an ice cream scoop, spoon into muffin cups. Bake for 20-25 minutes. Serves 8. This recipe came from Dierbergs Everybody Cooks magazine. In a medium saucepan, melt margarine over medium heat. Add rice; cook stirring occasionally until rice is lightly browned, about 5 minutes. Stir in broth, onion, and garlic. Cover and bring to a boil. Reduce heat and simmer until moisture is absorbed and rice is tender, about 15 to 20 minutes. Stir in peas and green onions. Season with salt and pepper. Makes 4-6 servings. Cook orzo in 1 quart boiling water for about 8 to 9 minutes, or until tender but firm. While the Orzo is cooking, heat a large skillet over high heat. Add the oil and swirl to coat the pan. Reduce the heat to medium and add the garlic, red pepper, and onions. Cook for about 2 minutes, stirring often. Add the spinach and cook for about 4 minutes or until heated through. When the pasta has finished cooking, drain and add to the spinach mixture. Add the lemon juice and feta cheese, tossing until combined Season with salt and pepper, if desired. Serves 6. This recipe is from Weight Watchers slightly altered. It makes 8 servings and each serving is 1 point. Heat oil in a large nonstick skillet or pot over medium-high heat. Add onion and cook until onion is tender, about 3 to 5 minutes. Add quinoa and garlic to skillet and cook until quinoa starts to turn golden brown, about 2 minutes. Add broth, black pepper, salt and red pepper flakes and bring to a boil. Turn heat down, cover and simmer for 13 minutes. Stir in spinach. Uncover and cook until spinach is tender and liquid is absorbed, about 3 to 5 minutes. This could also be served as a main dish. Serves 8. Each serving is 5 Weight Watchers points. Preheat oven to 350 degrees. Cut acorn squashes in half and scoop out seeds. Spray a large glass baking dish with cooking spray and place squash halves face down and bake uncovered for 20 minutes. While acorn squash is baking, in a large soup pot heat 1 tsp olive oil and brown turkey sausage on medium low heat. Chop chayote squashes into 1/2 inch pieces (it is not necessary to remove the skin) and onion and add to pot after turkey sausage is brown. Snip in the sprig of fresh sage, grind in the peppercorns, add parsely, and put the garlic cloves through a garlic press and add to pot. Cook all together for about five minutes. Remove squash halves from oven and turn over so the open side is up. Chop walnuts and add to mixture, along with cheese. Fill squash halves with mixture and return to oven for 30 minutes, uncovered. This recipe is from Cooking Light magazine, altered slightly. Makes 4 servings and each serving is 4 Weight Watchers PointsPlus points. Chop onions, artichokes and thyme. Heat oil in a medium saucepan over medium-high heat. Add onion and thyme, saute 5 minutes or until onion is tender. Add artichokes, saute two minutes or until thoroughly heated. Add broth and quinoa, bring to a simmer. Cook for 18 minutes or until liquid is completely absorbed. Remove pan from heat and stir in parsley, lemon peel, lemon juice and salt. It's delicious served warm or chilled. Slice squash in half, scoop out seeds, and put halves into glass baking dish cut side down. Add about 1/2 inch of water and bake covered for 45 minutes at 350 degrees. Remove squash from oven and let it cool. When it's cooled enough to handle, scrape pulp from one of the halves out of the skin and put pulp into a blender. Shake the blender jar slightly to level the pieces. If there is any water left in the baking pan, add that in. Add just enough additional water to blender jar to barely cover the squash pieces. Crumble one bouillon cube and one chopped up garlic clove into the blender jar. Puree the mixture until smooth, and pour into soup pot. Repeat with the other half of the squash and the other bouillon cube and garlic clove. This recipe is altered slightly from one I found in Sauce Magazine. Remove sausage from casing, and discard casing. Heat soup pot and swirl some olive oil in the bottom. Crumble sausage and add to soup pot, and cook while stirring until browned. Turn off heat. Cover a large plate with paper towels, and turn soup pot over onto plate to drain off excess oil. While the sausage is draining, wash kale and chop into bite sized pieces. Place soup pot back onto the burner without washing to retain some of the browned sausage flavor. Add sausage back to soup pot, and add five cups of chicken broth. Turn up heat. Add kale. Press garlic gloves with garlic press and add to soup pot. After the soup has come to a boil, turn down heat and simmer for about 20 minutes or unitl the kale is soft enough for you. While it's simmering, rinse and drain beans. After 20 minutes of simmering, add beans to pot and simmer for 5 more minutes. Add pepper to taste. Do you ever make something with fresh broccoli florets and you're not sure what to do with the leftover stems? I made some into a soup which turned out MORE than just pretty good, if I do say so myself. Heat some olive oil in a cooking pot big enough for soup. Saute the broccoli pieces until they are just starting to get a little browned. Add the chicken stock and ham bouillon cube and bring to a boil. Add the rice medley and oregano, reduce heat, and simmer for 15 minutes. I know not everybody has frozen oregano laying around! I grew the stuff I used and it is on the old side so if yours is fresher you might want to use less. If it's dried you'll want to use a LOT less - I've found out the hard way that if you overuse Oregano your whole dish can taste like truck tires, and that would be a shame! Heat a little olive oil in the bottom of a soup pot, and saute the onions for about two minutes. Add the ham, and continute to saute until the onions are clear and tender. Add the water, the boullion cube, and the pulp of two garlic cloves put through a garlic press. Bring contents to a boil, and add in the lentils. Simmer covered on low heat for 15 minutes. In large pot, melt margarine over medium heat. Saute onion until translucent. Add flour. Stir until slightly brown. Slowly add chicken broth. Mix in pumpkin and cook for 30 minutes. Add milk and heat through. Salt to taste. Makes 4 servings. Each serving is two Weight Watchers points. In large pot, melt margarine over medium heat. Saute mushrooms and onions until onions are translucent. Add flour and curry powder and gradually add broth. Bring to a boil and cook while stirring for two minutes. Add the pumpkin, salt and pepper and simmer for 10 minutes. Makes 6 servings, and each serving is 4 Weight Watchers PointsPlus points. Chop the onion, the leek (use the white part, put green part aside for making broth), and carrots. Heat the olive oil in a soup pot and add the chopped vegetables. Cook on medium-high heat until soft. Put garlic cloves through a garlic press and add. Add broth, split peas, bay, and rosemary. Bring to a boil, then simmer for one hour. Chop and add faux bacon about 15 minutes before it's done cooking. Makes 1 serving and it is 2 Weight Watchers PointsPlus points. Great the carrot and put it in a small saucepan. Add the contents of the envelope of miso soup, the broth and the arame. Bring soup to a boil and serve. This recipe is from Weight Watchers, modified. It makes four servings and each serving is 7 Weight Watchers PointsPlus points. Spray a large soup pot with nonstick cooking spray and put on medium heat. Brown the turkey sausage, breaking up lumps as you go. After it's nearly done browning, add leeks and cook until leeks are soft. Put garlic cloves through garlic press and add to soup pot, and cook for about 40 seconds longer. Add broth, potatoes, salt and pepper. Bring to a boil. Boil covered for 7 minutes, while soup is boiling chop the spinach into strips. When the 7 minutes is up, add spinach and cook for another minute. It's done! This recipe is based on a Weight Watchers recipe, altered. It makes 5 servings and each serving is 4 Weight Watchers PointsPlus points. To make vegetable broth, put vegetable and herb scraps in a large pot and add water to cover. Bring to a boil, then simmer while you get other ingredients ready. Seed bell peppers and cut into strips. Spray a cookie sheet with cooking spray and place pepper strips on it. Roast in oven at 400 degrees F for 20 minutes or until peppers are tender and browned on one side. Chop onion, celery, cauliflower and potato. In another large pot, heat olive oil then add onions and celery. Cook for about 5 minutes. When broth is done, strain it out and add 3 1/2 cups of broth and bring to a boil. Add cauliflower and potato and return to a boil. Add paprika. Reduce heat and simmer until potato is tender, about 20 minutes. Add sour cream to measuring cup and add water until you have 1 cup of sour cream/water mixture. Stir and add to soup. Let soup cool until it's safe to handle. Stir in fresh basil leaves. Puree in a blender, food processor, or with a stick blender. Reheat to serve if needed. This recipe is from ChefMd®, slightly modified. Makes 6 servings and each serving is 3 Weight Watchers PointsPlus points. Teriffic sauce for turkey, chicken, chicken nuggets, etc. Several hours before preparation, hydrate dried chipotle chili by soaking in water (you may want to reserve water for broth when you're done with it). You can substitue canned chipotle chili if you like then you don't have to soak it. Heat a large deep skillet or cast iron skillet over medium-high heat. Add garlic and onion. Cook five to six minutes or until garlic cloves and onion quarters are charred on all sides, turning periodically with tongs. Remove and let cool. Toast almonds. When cool enough to handle, grind in nut grinder. Chop chipotle chile and remove skins from onions and garlic and chop. Put in food processor with tomatoes, almonds, chocolate, chili powder, cinnamon and salt and blend until smooth. Heat oil in skillet over medium heat. Add sauce and cook until thickened, 6-8 minutes, stirring frequently. If you're tired of tomato sauce on your pasta all the time or looking for a new and different way to eat squash, try this! This recipe is originally from Stonyfield, altered slightly. It makes six servings and each serving is 4 Weight Watchers PointsPlus points. Heat oven to 375 degrees F. Seed and chop up squash. Place in a large baking dish with garlic, olive oil, salt, sage and pepper. Stir until well blended and back for about 40 minutes or until squash is tender, stirring halfway through. When cool enough to handle, transfer contents of baking dish to food processor and pulse until smooth. Add yogurt and broth and blend. Reheat for serving with pasta if necessary. Preheat oven to 350 degrees. Cream butter and sugar. Stir in beaten egg and vanilla. Mix in lavender flowers and flour. Drop by spoonful onto greased cookie sheets. Bake 15 to 20 minutes until golden. This recipe is from the Webster Groves Herb Society cookbook. I altered it slightly. If you need a source of culinary lavender, Penzys Spices in Maplewood has it, and so does Cost Plus World Market in Brentwood, MO. Heat oven to 375 degrees. Cream together butter, sugar, and vanilla. Beat in egg. Stir in sesame seeds, pecans, and tarragon. Sift dry ingredients together and add to mixture. Mix well. Drop by teaspoonful on greased baking sheet. Bake for 8-10 minutes. This recipe is from the Webster Groves Herb Society cookbook. The only thing I changed was ungreased cookie sheet to greased since I had problems with mine sticking a little. They really spread out, so don't put them too close to the edge or to each other. They look a little weird but taste fantastic! Plain old instant chocolate pudding mix is pretty tasty, but if you're in the mood for something a little extra intense and satisfying for your dessert, try this. Prepare the instant pudding according to the directions on the package. Add cinnamon, stevia, and cocoa powder, mix thoroughly, pour into serving dishes and chill. Great after a spicy Mexican meal! Variation - try almond extract instead of the cinnamon - mmmm! This is an modification of an original recipe from the booklet "Recipes, Directions, Decorating Hints" packaged with a vintage Mirro dial-a-cookie Cookie Press that used to be my Mom's. I had a kid-sized cookie press of my own when I was small. I was not able to get the cookies to come out of the press right then or now (I'll keep trying), but the cookies are just fine dropped onto a sheet a heaping teaspoon at at time, which is what I'll do until I master the cookie press. Cream shortening and sugars well. Add lemon and lime juice. Beat in egg. Gradually blend in baking soda, salt, turmeric, lemon balm, lime balm, and flour. Drop heaping teaspoons of dough onto an ungreased cookie sheet. This recipe was based on a cookie recipe on the back of a box of Hodgson Mill Insta-Bake Baking Mix. I changed some of the quantities a bit and used dried cranberries and pecans instead of raisins. Preheat oven to 350 degrees F. Mix brown sugar, butter, vanilla, eggs and milk in a bowl. Stir in remaining ingredients. Drop dough by rounded teaspoonfuls about 2 inches apart onto greased cookie sheet. Bake until light brown, about 10-12 minutes. I downloaded this recipe from the internet several years ago and changed it slightly. Bake in mini loaf pans for holiday gift giving! Makes five mini loaves. Wash the oranges, grate the zest from them, and put zest in a small bowl. Squeeze juice from oranges. Measure 3/4 cup of the juice and pour into a mixing bowl. Reserve the remaining juice. To the 3/4 cup of orange juice, add half of the orange zest, egg, and cooking oil. In another bowl, combine the dry ingredients: flour, sugar, baking powder, salt, and baking soda. Add orange juice mixture and stir until moistened. Fold in cranberries and pecans. Pour batter into lightly greased mini loaf pans. Bake at 350 degrees for about 20-25 minutes, until a pick inserted in the middle comes out clean. Cool bread in pans about 10 minutes, remove and let cool thoroughly, then glaze. Want a knockout dessert course? Serve these clusters with port wine, stilton, and white cheddar blueberry cheese. Recipe from ChefMd®, modified. Score the pomegranate and place in a bowl of water. Break it open under water to let the arils sink to the bottom and the membrane float to the top. Pour through a colander, rinse, and set the pomegranate arils on paper towels to absorb any excess moisture. Melt chocolate in a heavy-bottomed small saucepan over low-to-medium heat stirring frequently, 2 to 3 minutes. Stir in mint. Remove saucepan from the burner. Add pomegranate seeds and stir in curry powder. Use a fork to scoop out small chocolate-covered clusters, and place each on a wax paper lined plate. Refrigerate until chocolate is firm, about 15 minutes. This recipe is from Weight Watchers, altered. It makes 20 servings, each serving being 2 Weight Watchers points. Line an 8-inch square baking pan with plastic wrap, leaving 2-inch overhang. Smooth out any wrinkles. Combine chocolate, condensed milk, vanilla and 1/4 tsp of the coarse salt in a large saucepan. Cook over medium low heat while stirring until chocolate is melted and mixture is smooth. Transfer to baking pan and smooth top with spatula. Sprinkle remaining 1/2 tsp of coarse salt over the top. Let cool, then cut into 20 pieces. This recipe is so decadent I probably shouldn't have made it, but my Mom requested pound cake and she likes lavender so I made this recipe for her from The Lavender Cookbook that we both have a copy of, but don't often make things from because the recipes tend to be complicated and high in calories. It's a fun book to read to get ideas for unusual flavor combinations. I altered the recipe to make it somewhat better for your health, and although I'm including the Weight Watchers points so if you're on Weight Watchers you know what you're getting into, be cautious! It's probably bad just to read the ingredient list! The recipe is also time-consuming and you'll have to wash half the cooking implements in your kitchen when you're done. It is really really delicious though. It made one large loaf and four mini loaves. I'm counting it as 14 servings since I sliced the big loaf into 10 slices. Each serving is 12 Weight Watchers points. The original recipe called for pomegranate syrup in place of the pureed raspberries, I was out of pomegranate syrup so I used a substitute. If you use pomegranate syrup, try adding less at first because pomegranate syrup is very tart - taste and see if a smaller amount will do before you add more. Preheat oven to 325 degrees F. Grease and flour a 9 x 5 inch loaf pan and four mini loaf pans. Place the lavender in a spice grinder with 2 TBSP of the white sugar. Pulse until the lavender is finely ground. Transfer to a small bowl and stir in the remaining sugar. Sift the flour and baking soda together three times. In a small bowl, mix the sour cream and honey. Separate the eggs, placing the whites in a large bowl and the yolks in a cup. Add 1/4 tsp of the salt to the whites and beat with an electric mixer until stiff peaks form. In another large bowl, combine the butter and sugar. Beat with the mixer until fluffy. Beat in the vanilla and the remaining 1/4 teaspoon salt. Beat in the yolks one at a time. Beginning with the dry ingredients, alternately beat in the flour and sour cream in three additions each. Fold in the egg whites. Pour into the prepared pans (fill about 3/4 full of batter). Put pans in the oven, and start checking for doneness at around 30 minutes. When the edges are golden brown and a pick inserted in the middle comes out clean, they're done. When done, let cakes cool then mix the white chocolate topping. Melt the white chocolate chunks slowly in a double boiler. Open the can of raspberries and empty into a blender and puree. Mix 1/4 cup of puree into the white chocolate, and reserve the rest of the raspberries for something else (smoothies maybe?). Drizzle white chocolate mixture over the tops of the loaves. Makes 24 servings and each serving is 3 Weight Watchers PointsPlus points. Preheat oven to 350 degrees F. To make crust, mix together flour and brown sugar in a medium to large bowl. Crumble lemon basil with fingers and add. Melt butter and gradually add to flour mixture, mixing well with fork as you go. Spray 13 x 9 x 2 in baking dish with non-stick cooking spray and press in crust mixture. Bake for 20 minutes. Add eggs to bowl and beat until blended. Add vanilla extract, powdered sugar and the zest and juice of three lemons, then mix well. When crust is done, pour lemon mixture over crust, turn oven temp down to 300 degrees F., and bake for 30 minutes. After removing from oven, let cool and cut into 24 bars. Preheat oven to 375 degrees F. Coat a baking dish with cooking spray. Slice peaches and add to pan. In a medium sized microwave safe bowl, mix together brown sugar, flour, chia seeds, wheat germ, flaxseed meal, cinnamon and salt. Sprinkle over peaches. Add butter to bowl and melt in microwave. Add eggs, lime juice and applesauce. Mix well and pour into baking pan over peaches and dry ingredients. Bake for about 45 minutes or until fruit starts to bubble. This recipe is from Steven Raichlen's Healthy Latin Cooking, altered. It makes 12 servings and each serving is 7 Weight Watchers PointsPlus points. If you are in the St. Louis area, you can get guava paste from Jay's International Foods. Position a rack in the lower third of the oven, and preheat to 350 degrees F. Coat an 8" springform pan with nonstick spray. Wrap a piece of foil around the bottom and sides of the pan. Bring 4 cups of water to a boil. Puree the cottage cheese in a food processor. Add cream cheese, guava paste and sugar and puree until smooth. Add the eggs and egg substitute, lime juice, lemon peel, vanilla extract and salt. Process until well combined. Pour into pan. Set pan into a large roasting pan and pour boiling water into roasting pan until it reaches 1" up the side of the pan. Bake for 35 minutes or until a pick inserted in the middle comes out clean. Refrigerate for 3-4 hours then cut into 12 slices and serve. Makes 8 servings and each serving is 7 Weight Watchers PointsPlus points. Preheat oven to 325 degrees F. Spray 9 x 13 inch baking pan with cooking spray. Puree persimmons in a food processor. In a mixing bowl, combine persimmon pulp, baking soda, sugar and eggs. Mix well. Add flour, baking powder, cinnamon, vanilla, salt, milk, melted butter and applesauce. Stir to combine. Pour into baking pan and bake for 55 minutes. This recipe makes four servings and each serving is 5 Weight Watchers PointsPlus points. Preheat oven to 325 degrees F. Mix all ingredients together and pour into ramekins 3/4 full. Bake for 25 minutes or unitl edges are golden brown and middle no longer looks shiny. Preheat oven to 350 degrees F. Spray muffin pan with cooking spray. Mix all dry ingredients (except chocolate chips and walnuts) together in one bowl and mix well. Mix wet ingredients together in another bowl and mix with beaters. Fold dry ingredients into wet gradually while beating. Fold in walnuts and chocolate chips. Scoop batter into muffin tin and bake for 30 minutes or until a pick inserted in the middle comes out clean. Break four eggs into a bowl. Add the chives, fish sauce, and milk. Heat a skillet, add the oil, and scramble the eggs. You probably won't need to add any salt, since the fish sauce adds enough. Taste it first and see if you agree. I make this for breakfast usually, but it would probably be really good crumbled over fried rice. I'll have to try that sometime. This is a favorite recipe from the Dierbergs Everybody Cooks magazine that I have modified. Here is what I like to make when I buy bananas and forget to eat them all before they start to get mushy. Preheat oven to 350 degrees F, (or 300 if you're using my oven). Spray muffin pan cavities with cooking spray. Put all ingredients into a large mixing bowl. Mash bananas together with other ingredients with a potato masher. Finish mixing ingredients together with large spoon. Fill muffin pan cavities 2/3 full of batter, and bake until pick inserted in the middle comes out clean (approximately 15 minutes). This recipe makes a large batch of batter so you'll probably have plenty left to freeze and bake later. Houston Lighting & Power Company - I bought this brochure in an antique shop in Springer, New Mexico. Spicy and satisfying, will keep you going until lunchtime! Makes 6-8 burritos. Chop chicken sausages, and put in medium sized bowl. Add chopped garlic, mushrooms, onions and peppers, and mix all together. Put a skillet on medium heat and melt a pat of butter or margarine. Add a handful of sausage/veggie mix to the skillet and saute until the onions are just starting to turn golden. Break two eggs into skillet, and add black pepper to taste. Scramble all together until eggs are done, and wrap in a warmed tortilla. Repeat to make each subsequent burrito, adding more butter and margarine if needed. Makes 8 mini loaves. One serving is half a mini loaf, and each serving is 3 Weight Watchers points. Preheat oven to 350 degrees F. Spray eight mini loaf pans with cooking spray. In a large bowl, combine the yogurt and sugar and beat with an electric mixer until smooth. Add the eggs one at a time, beating after each addition. Add lavender, baking soda, salt, walnuts, vanilla extract and flaxseed meal and mix well. Add flour and mix well. Add bananas and mash with potato masher, mix well, then mix in blueberries. Fill each mini loaf pan 2/3 full and bake for 30 minutes or until edges are golden brown and a pick inserted in the middle comes out clean. This recipe makes 12 muffins, and each muffin is 2 Weight Watchers points. Preheat oven to 350 degrees F. Line a muffin tin with 12 paper muffin liners. Get out a large mixing bowl. Wash the orange and grate the zest into the bowl. Juice the orange and add the juice and pulp into the bowl. Add all other ingredients and mix well. Distribute the batter between the 12 muffin cups and bake for 15 minutes, or until the muffins are golden brown and a pick inserted in the middle comes out clean. This recipe is from Weight Watchers, altered. It makes 6 servings and each serving is 6 Weight Watchers PointsPlus. This is worth making just for the heavenly smell - luckily it tastes great too! Empty the juice concentrate into a pot and add two and a half cans of water. Add barley, wheat berries, groats, cinnamon stick and salt. Bring to a boil, then simmer uncovered for 40 minutes, checking and stirring occasionally. Chop up dried apricots and add to pot, and simmer for another 10 minutes. This recipe is from Weight Watchers, altered. Easy and delicious! It makes six servings, and each serving is 3 Weight Watchers points. If you want it spicy, add cayenne pepper powder or your favorite chopped hot pepper fruit. Normally I'm not very satisfied with the taste of fat-free cheddar cheese, but in this recipe the richness of the other ingredients makes it more than acceptable. Preheat oven to 350 degrees F. Coat a medium baking dish with cooking spray. Slice bell pepper into thin strips. Place potatoes then vegetables in the baking dish. Slice sausage and distribute on top. Sprinkle cheese over top. In a small bowl, beat together milk, eggs, salt and pepper, then pour over all. Bake until cheese is browned, about 45 minutes. Cut into six pieces then serve. Variation - I made a batch with broccoli and tomato instead of the bell pepper, and it was great! Makes one serving and it's 6 Weight Watchers PointsPlus. Boil an egg. Let it cool long enough to handle. Slice egg and place on 1/2 of english muffin. Add cheese slice, top with other half of english muffin, and heat in microwave for 1 minute. Makes 8 muffins, and each muffin is 3 Weight Watchers PointsPlus. Preheat oven to 350 degrees Fahrenheit. Put all ingredients in bowl and mix well. Pour into muffin pan that has been sprayed with cooking spray, and bake until golden and pick inserted in the middle comes out clean, about 15-20 minutes. Makes 18 servings and each serving is 4 Weight Watchers PointsPlus points. Preheat oven to 325 degrees F. Coat a large loaf pan with cooking spray. Peel bananas and cut into chunks. Place in large mixing bowl and crush with potato masher. Add melted butter, agave nectar, egg, skim milk, wheat germ, and flaxseed meal. Beat all together until blended. In another medium to large bowl, place whole wheat flour, white flour, baking powder, baking soda and salt. Sift together until well mixed. Gradually beat into wet mixture. Fold in walnuts. Fill baking pan 3/4 full and bake until pick inserted in the middle comes out clean, about 1 hour. If there is extra batter, bake in mini-loaf pans, muffin tins or ramekins (baking time for smaller loaves will be considerably less). Makes four servings and each serving is 9 Weight Watchers PointsPlus points. In a large bowl, whisk together whole wheat flour, wheat germ, brown sugar, baking powder and salt. In a medium sized bowl, whisk together skim milk, banana puree, egg and carmel flavoring. Gradully add liquid to flour mixture, mixing as you go. Slice strawberries and toss in bowl with Fruit Fresh. To make one serving, measure out 3/4 cup batter. Spray pan with cooking spray and cook pancakes. Top with 1/2 container of yogurt and 1/2 cup strawberries and serve. Makes 9 servings and each serving is 4 Weight Watchers PointsPlus points. Preaheat oven to 350 degrees F. Coat a 9 x 13 baking dish with cooking spray. Combine dry ingredients in large mixing bowl and mix well. Combine wet ingredients in mixing bowl and mix well. Add wet ingredients to dry and mix well. Spread batter evenly in baking dish and bake until golden brown and pick inserted in the middle comes out clean (approx. 30 minutes). One serving is 1/2 of a mini-loaf. Makes 16 servings, and each serving is 5 Weight Watchers PointsPlus points. Preheat oven to 350 degrees F. Spray 8 mini loaf pans with non-stick spray. Mix the dry ingredients together in one bowl. Mix the wet ingredients together in another bowl, then blend both together. Pour batter into pans and bake until edges are golden brown and a pick inserted in the middle comes out clean, about 30-45 min. This recipe is from Whole Living Magazine, altered. It makes four servings and each serving is 7 Weight Watchers PointsPlus points. Rinse quinoa. In a saucepan, bring quinoa, almond milk, water, vanilla extract salt and cardamom to a boil. Reduce heat and simmer, covered until liquid is absorbed, about 15 minutes. Remove from heat and let rest 5 minutes, then fluff with a fork. For each serving, top with 1/2 of a oear, sliced, and 1 TBSP almonds. I was looking through the Penzys Spices catalog and I saw some recipes I wanted to make that used their Greek Seasoning. I didn't happen to have any, but I figured I had enough ingredients to make my own, so I used items from my cupboard to make a similar blend. After making the salad dressing above and noticing the mucilaginous nature of the prickly pear fruit and the way my hands felt nice and smooth after making it, I wondered if the discarded pulp and skin could be used in making shower gel. I have ingredients for making it on hand since I like to make a lot of my own bath products. It was my assumption that the vinegar and oil that was likely to be clinging to the discarded pulp/seed mixture would do no harm and might help, since those are often used in home skin-care preparations anyway. I looked up uses for prickly pear on the internet and found that it has some qualities in common with Aloe vera. Why not try it then? First I put the seed/pulp remnants and skin that I had earlier removed from the fruits into a pot and poured enough water over it to cover. I brought it to a boil, then turned off the heat. Next when I thought it had cooled enough to pour into a plastic container without melting the container, I poured the liquid through a strainer into an empty OxyClean bucket, which has become my favorite liquid soap mixing container. It's just the right size and shape. This time I really did discard the seeds and what little pulp was left! I then added 1 tsp of thickener and mixed it in with a stick blender. Then I let the mixture cool to room temperature. I knew I'd need a preservative since I was using fresh fruit, so I added Germaben II. To (hopefully) help retain the pretty pink color, I added some Fruit Fresh powder. I keep lots of Aloe Vera plants growing around the house, so I pulled off three leaves, rinsed them off, then chopped them up and added them to the mix. I shredded them with the stick blender, then strained the mixture again to remove the Aloe pieces, pressing hard to get all the juice out. Since I was going through all this trouble, I went all out and added Humectant, Goats Milk Powder, and the contents of three vitamin E capsules. To mask the vinegar smell, I added some of my favorite essential oils: Lemongrass, Grapefruit, Tea Tree and Lemon. Then to help it all mix together, some Polysorbate 20. After all that, it was finally time to add the actual soap! I added Super Concentrate a couple of tablespoons at a time, mixing with the stick blender, until the thickness seemed right for hand soap and shower gel. Then I poured the mixture into an empty pump-top dispenser bottle. The results - successful if you ask me, since I keep opening the bottle to smell it and it makes my skin feel great. Wonderful lather too. If you want to read more about my adventures in soap making, click here. Great for sweetening beverages or baked goods, and if packaged nicely, would make a great gift. I got this recipe from The Lavender Cookbook, but halved the amount of sugar for a more intense lavender flavor - I like strong flavors! In a spice grinder, pulse the lavender with 1 tablespoon of the sugar until finely ground. Transfer to a bowl and stir in the remaining sugar. Transfer to a jar, cover tightly, and let stand for at least three days before using. I grow a lot of Sage, and was interested in finding a way to use some of the stems, which smell heavenly, as well as the leaves, so I made some sage and juniper berry-infused vinegar for Christmas gifts one year. This vinegar makes a great gift if packaged in a pretty bottle and labeled with a decorative tag. Makes a good base for a meat marinade. Could be part of a really spectacular gift for people who like to grill if packaged with recipes, flavored oils, bundles of dried herb stems to toss into the fire, neat grilling tools, etc. Crack a quantity of dried sage stems and place in a large clean glass container. Cover with white balsamic vinegar. Put tight cover on container and store in a dark place for about a month before you want to bottle the vinegar. Shake contents periodically. Get some clean decorative bottles with tight fitting stoppers - Cost Plus World Market is a good source for bottles and containers, as well as for the juniper berries. Put some pretty sage leaves still on the stem and some juniper berries into each bottle. Strain the vinegar, and fill bottles. If you're like me and have a pet starling, you know that there is no commercial starling food available. Here is the staple food of my pet starling, Attila. Brew some decaffeinated green tea and let it cool. In a bowl add the dry cat or dog food, the poultry mash and the Prime bird vitamins. In a mortar and pestle, grind up a calcium tablet to powder and add to the bowl. Mix the dry ingredients, then add 14 TBSP of green tea and mix again. Let sit for awhile then break up the larger pieces with a fork. Attila likes the consistency of his food to be just slightly damp and clumping. Your starling may prefer it to be wetter or drier. Divide the food into a series of small freezer-safe containers (empty mealworm containers are good) and keep one container at a time in the refrigerator and the rest in the freezer until needed. In addition to this basic staple diet, Attila gets the following as treats and supplements - mealworms, crickets, guppies, Quiko Goldy Egg Bird Food , melon, spinach, arugula, dandelion greens and flowers, fresh herbs from the garden (lemon balm, lime balm, korean hyssop, oregano, peppermint, cilantro), cooked chicken, tuna, figs, grapes, blueberries, raspberries, apple, cheese, sprouts, peas, cucumber, broccoli, mango, papaya, yogurt, peaches, tomato, freeze-dried bloodworms , Omega One Kelp Pellets, Xtreme Cichlid Diet and samples of what I'm eating if they're ok for him to have. He also likes live shrimp, crayfish and snails if he can grab one out of one of my aquariums. I avoid giving him avocados, chocolate, caffeine, alcoholic beverages, and things with a lot of salt. For more information on caring for pet starlings, see starlingtalk.com. Instead of buying broth to use in recipes, you can make vegetable broth to keep on hand in the freezer. Whenever you chop vegetables or herbs, save the parts you would usually throw away - end pieces, tough parts, stems, skins, etc. Keep them in a gallon size zip-loc bag in the freezer. Whenever the bag gets full, empty the contents into a large soup pot, boil with water for half and hour or so, then strain out the vegetable parts and discard. If you keep this mixture in a freezer and microwave safe container, you can thaw (or just partially thaw depending on how much you need) some whenever you need it in a recipe. It's best to stay away from vegetables or herbs with really strong flavors such as cilantro, peppermint or anything that might clash with other flavors. I've used parts from basil, bell pepper, kale, broccoli, onions, garlic, cucumber, zucchini, beets, romaine lettuce, mushrooms, celery and many others with very good results. It's a good way to add extra flavor and vitamins to your recipes for no cost and with no fat. Variation: making broth is also a good way to extract some flavor from animal products that would be discarded, such as shrimp legs and tails, bones, etc. If you chill the broth in the refrigerator before you freeze it, you can skim any solidified fat off of the surface to reduce calories. Here is one of many different ways to make Garam Masala. Put coriander, cumin, fenugreek, peppercorns, cardomom, cloves and bay leaves into a skillet. Toast spices lightly. Put toasted spices into a spice grinder along with ginger, cinnamon and saffron. Grind and store in a small jar. Would you like to sign up for my newsletter so you can be notified when I have new products, articles, project ideas, or news to share with you? NEW - free download exclusively for subscribers in each issue!